We left Kalalock at 7:50 headed for the ferry to Whidbey Island at Port Townsend. Forks Outfitters Parade Float, the store that wasn't a Walmart. Traveling through Forks, we stopped at the sporting goods/hardware/grocery/department store all in one. No, it wasn't a Walmart! As we arrived the Fourth of July Parade was assembling in the parking lot of the market. When we asked about a place in town for breakfast the checker announced, "Oh, they may have already closed because the roads will be closing soon." The roads would be closing? We had a ferry to catch! We continued on through the part of Olympic National Park that skirts Crescent Lake and were reminded we need to return to this part of the park and spend more time. I don't think we've been to Lake Quinault. With the help of Yelp we had breakfast the New Day Eatery in Port Angeles. Sat looking out on Front Street. This was a great place to sit and people watch! I had a coconut pancake with Lemon butter and coconut maple syrup and a long awaited latte, what I miss most in my camper. 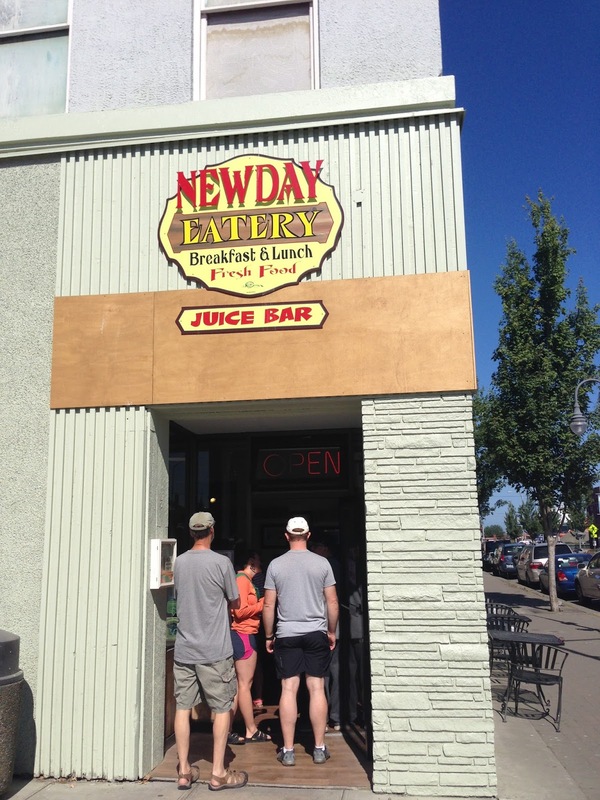 Inside the New Day Eatery, must have been Harrington's Cafe in an old day! Mark enjoyed a Pancetta Flat bread with egg, pancetta, tomato, arugula, & pesto aioli on flat bread. Both were excellent. At 11:15 we were back on the road to Port Townsend, giving us about 2 hours until we needed to be in line for the Ferry to Whidbey Island. For the 4th of July traffic traveling east was very light. It was a beautiful 75 on this part of the Olympic Peninsula. After settling in to our campsite we drove around the old fort and over to Coupeville to explore. We were late enough, on the 4th, that all the stores were closed. Coupeville is the second oldest town in the state of Washington with over 100 buildings on the National Historic Register. Although their were no fireworks (supposedly) on the islands it sounded like the whole sound area was being bombarded for about 2 hours. One set of blasts would stop and another would start. As I looked out the window of the camper I could see distant flashes. We actually slept about 10 hours last night! Awoke to another beautiful coastal morning. After coffee and a walk on Fort Casey Beach, Mark was raring to get on the road and find shots while the light was good. That means early morning! Actually over cast began to move in as we left camp, on our way to Coupeville to find a bakery for something for breakfast. I had noticed the building below, so we checked their bakery items. We ended up with an all day cinnamon roll, which we shared. Venturing on we visited what I believe is the central, south part of the island, stopping at Greenback Farm. Greenbank Farm is a community-founded nonprofit organization which manages 151 acres of publicly owned space and a historic farm, located at the center of Whidbey Island. We meandered through the galleries as they were opening. As I was admiring one of the felted flowers on display at one of the galleries the proprietor told us we should visit Langley, if we were interested in art. We continued on to Langley, not finding the gallery with the felted work, but we did enjoy the quaint town and the shops. We were both impressed by a small shop called Edit. I couldn't resist buying a jar of raspberry chocolate jam from, Chocotere, she had just made in the morning. Unfortunately, she ran out of time for making her chipotle chocolate raspberry jam! We weren't sure where the time had gone. We were unsure of what we would do with 2 days at Fort Casey and afternoon was quickly approaching and we had to get our laundry done. There were only 2 laundromats I could find on Whidbey Island, one at Langley and one in Oak Harbor. Driving into Oak Harbor, Sunday traffic was lined up on the highway. Oak Harbor is home of a Naval Air Station and has all the appearances of a military town. We spent the afternoon in the laundromat and didn't really explore. The character of the other towns we had visited was lacking here. We had much we still wanted to see, a return trip to this island is a must. The Salish Ferry which was bound for Port Townsend was just a short walk from our campsite. 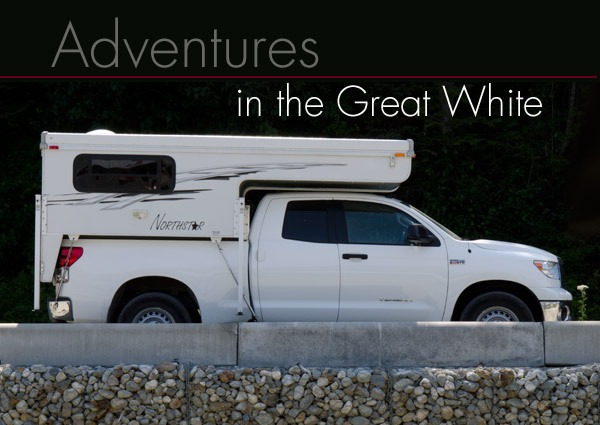 We decided to board it for dinner in Port Townsend, leaving Great White behind at the campsite! The only place we could find that appealed to us AND was open on a Sunday night was a pizza place. I had found one on Yelp that sounded excellent, which was closed. Having plenty of time until our 9:10 ferry left we took our time at a very slow pizza restaurant, only to get to the dock at 8:35 and find a, "CLOSED" sign in the window of the toll booth. The 9:10 ferry had left at 8:30, the schedule I looked at was a Saturday schedule, today was Sunday. 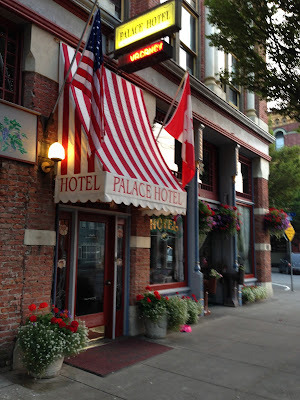 We contemplated which direction to travel for a room, ending up at the Palace Hotel, a former brothel on a warm Port Townsend night. Our room, with 2 story high ceilings and windows was the Miss Sarah. Funny thing. a man sailing over on the ferry had mentioned what an interesting place this was after telling us the town was full of hippies and artists, not a working town like Port Angeles. He happened to have been born in Port Angeles. Thank goodness it was Sunday the 5th, not Saturday the 4th! We could were able to get a room for $99.00, we don't usually go for historic lodgings, but this sufficed. The Palace Hotel was built in 1889 for 28,000 by a retired sea captain, Henry Tibbals. He went to sea in 1839 at the age of 10. He had many careers in port Townsend, served on town council and as sheriff, postmaster and county commissioner. The first floor of the hotel was originally a billiard parlour and saloon known as the Townsend Tavern, the upper two flours were rooms for rent. It later housed The Call Newspaper, an Egyptian Theater, the Northern Pacific offices, a grocery store, a state liquor store, a florist shop and several restaurants. The upper flowers were underused for many years. From 1925 to 1933, the upper two floors were known as The Palace Hotel, affectionately nicknamed The Palace of Sweets as it operated as a brothel and hotel. The room that the madam of the house occupied is now decorated much the same as it was then. Restoration began in 1976. Each room was named for one of the girls.